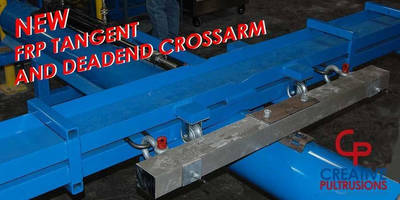 Alum Bank, PA - Creative Pultrusions, Inc., has obtained a third patent on its SuperLoc(TM) pultruded bulkhead system. The system includes a series of sheet pile shapes, sheet pile caps and a pultruded wale section. The various shapes are utilized to construct an extremely corrosion resistant bulkhead used for the protection of waterfront assets. A patent has been assigned for the wale and retaining wall system (US 7,604,438 B2). The other patent numbers are US 7,311,470 B2 and US 6,893, 191 B2. Shane Weyant and Dustin Troutman are the inventors and are named on all three patents. Both inventors have been working on these patents since 2005. Creative Pultrusions, Inc., a subsidiary of Hill & Smith Holdings PLC, is The World's Most Innovative Leader in the Fiber Reinforced Polymer Composites Industry. Established in 1973, the company operates in Alum Bank, Pennsylvania and provides innovation solutions to corrosion needs. For more information please contact Dustin Troutman at 814-839-4186 Ext. 237.